Veliko what? Where are we going? Bul­garia. What a sur­pris­ing touris­tic gem. Cre­ators of the Cyril­lic alpha­bet, always on the los­ing side of war, the gate­way to Europe, where do I start a blog post about Bul­garia? Let’s start with what I knew about Bul­garia before get­ting there. Noth­ing. 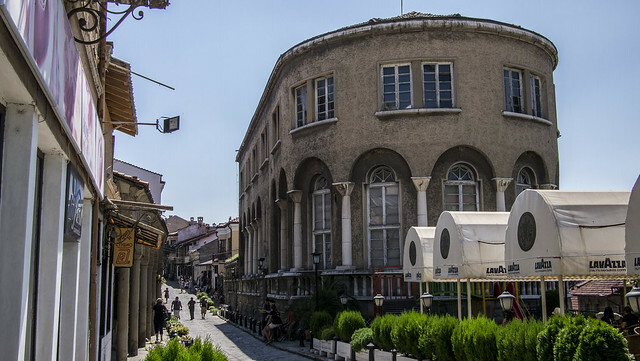 Well, almost nothing…I new Sofia was near the top of the list of the world’s cheap­est cities to back­pack. 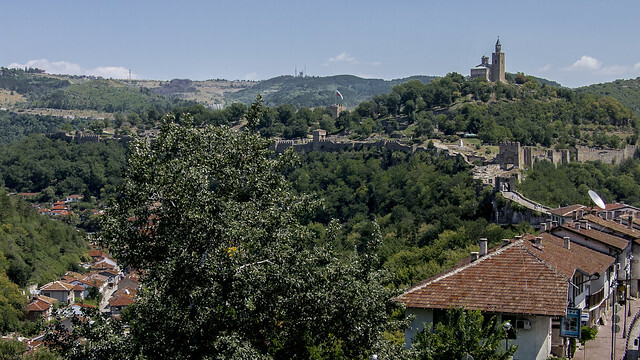 After vis­it­ing Sofia, we decided to visit Veliko Tarnovo. It is famous for its five thou­sand years of his­tory, cul­tural con­tri­bu­tions to Europe, and being the cap­i­tal of the sec­ond Bul­gar­ian empire between the 12th-14th cen­tury. Today, Veliko Tarnovo is a pic­turesque, his­tor­i­cal moun­tain town, not to men­tion a great place to spend my 31st birthday. Upon arrival, we found a great hotel with a bal­cony over­look­ing the town, includ­ing break­fast and air con­di­tion­ing. Life was good. The only thing miss­ing was was a pool, but wait! Off to the right of our hotel was a lux­u­ri­ous four star hotel, and I could see their pool from our bal­cony. It became my per­sonal goal to make that pool my own; I just needed the per­fect plan to sneak in. Helene’s favourite hotel. Can you guess why? 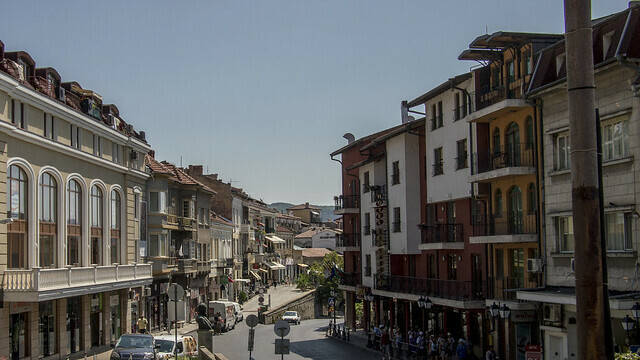 Our first day in Veliko Tarnovo was as typ­i­cal of any of our first days in a new city. 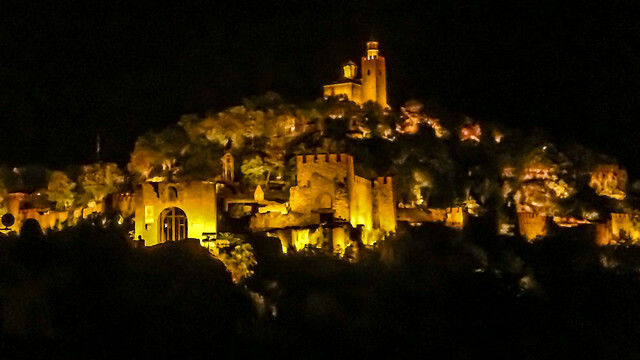 We explored the town, ate din­ner at a nice restau­rant, and didn’t do much else. We noticed shops, old build­ings, murals and a cas­tle, but we had no idea what any of it meant. It was clear that we needed to put in a lit­tle effort to fig­ure it out. But how? That was a prob­lem for later. Our sec­ond day in Veliko Tarnovo was my birth­day. I had full reign to do what­ever I wanted, and I wanted to sleep. So sleep I did. Helene promised to not wake me up for the free break­fast, a deal I made the night before that I cer­tainly did not regret. Instead, I woke up to break­fast in bed and tons of Face­book messages. For my birth­day, I planned to find a way, what­ever it took, to swim in the pool next door. Despite the typ­i­cal Gros­jean char­ac­ter to not break any rules, Helene was both com­plicit in the plan and my accom­plice for the day. We con­spired pos­si­ble ali­bis includ­ing play­ing dumb, pre­tend­ing to be cus­tomers, and look­ing for our car. 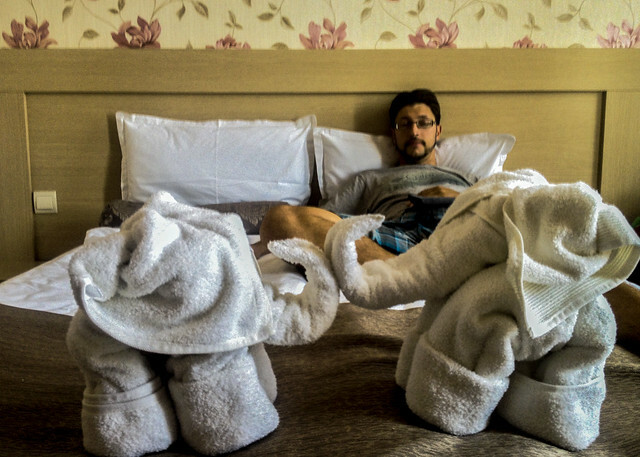 In hind­sight, I don’t think we broke any hotel rules, as the place was more like a restau­rant, but it is fun to think we did. Note to any other trav­el­ers: Hotel Premier’s pool is a must do on a hot sum­mer day. 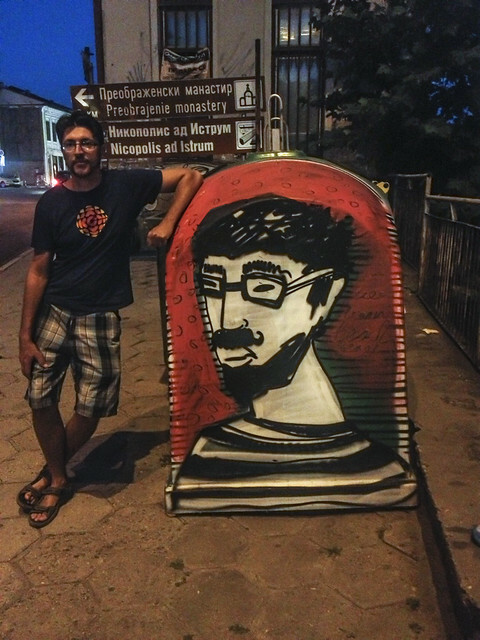 For our third day in Veliko Tarnovo, we went on a free walk­ing tour. I love these tours because we have a per­fect track record of meet­ing cool peo­ple. Not to men­tion, they are also a great way to learn about the city. Our first stop on the tour was the Mother Bul­garia memo­r­ial. 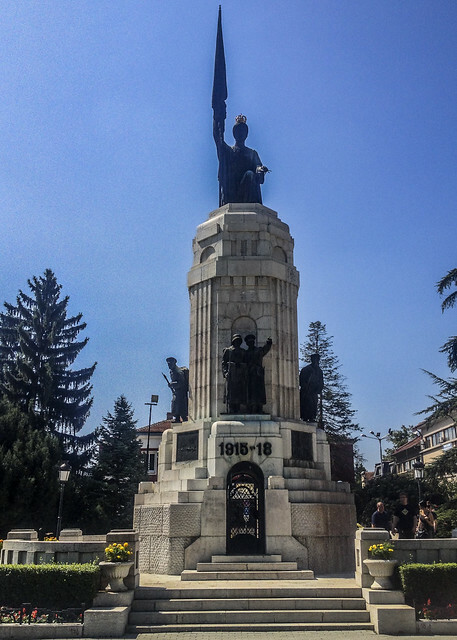 Bulgaria’s bor­ders have changed time and time again, usu­ally involv­ing war. There have been three inde­pen­dent Bul­gar­ian states and many occu­pa­tions of Bul­garia. 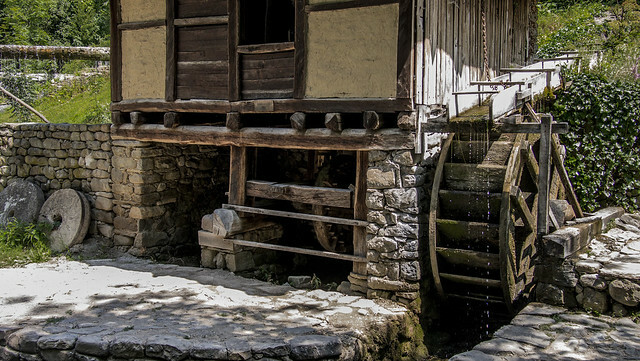 The Greeks, the Seljuks, the Romans, the Byzan­tines, the Ottomans, and the Sovi­ets all share a part of Bulgaria’s his­tory in one form of suc­ces­sion or another. The memo­r­ial pays trib­ute to fallen sol­diers of the Russo-Turkish war of 1877–1878, the Serbian-Bulgarian War of 1885, the Balkan wars of 1912–1913, and WW1. We walked a cou­ple kilo­me­ters before we got to the tour’s main attrac­tion: the cas­tle. 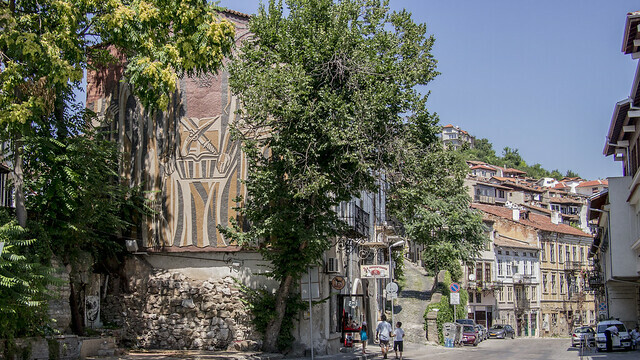 Dur­ing our walk to the cas­tle we had seen a soviet era build­ing com­plex, an Ottoman era mar­ket, ortho­dox churches, stat­ues and murals remem­ber­ing key peri­ods of his­tory. 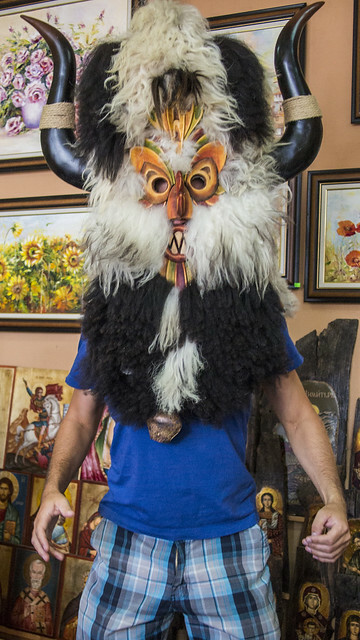 Our guide even handed me an an old folk­lore mask and I tried it on. I’m not sure which god I sum­moned with it, but I hope it brought me good for­tune. 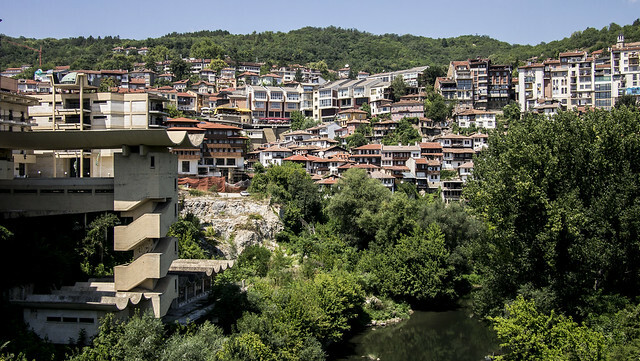 It was clear that Veliko Tarnovo is a rich his­tory les­son in Rome, Turkey, Greece, Rus­sia and the Balkans. An impres­sive sight from far, the fortress is cred­ited as being one of the strongest fortresses in the region’s his­tory, as well as being a site for some good drama, includ­ing old tales of love, love-lost, affairs, and murder. 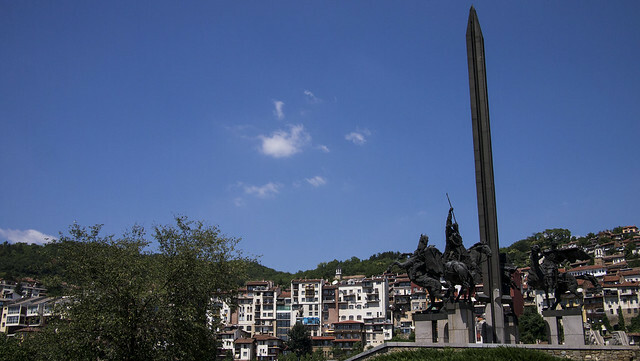 The tour’s last stop remem­bered Bulgaria’s national hero, Vasil Lev­ski, who was from a nearby town and has roots in Veliko Tarnovo. 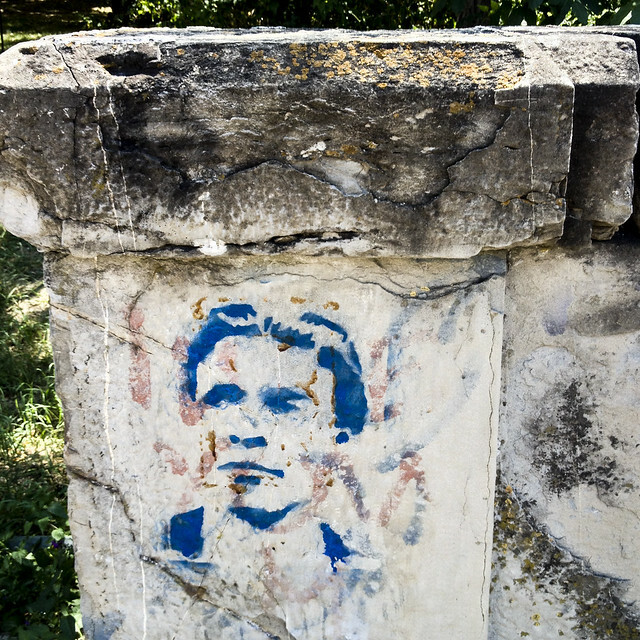 City murals today pay trib­ute to his con­tri­bu­tions. He is cred­ited with cre­at­ing a vast net­work of sup­port­ers that over­threw the Ottomans. He never lived to see a free Bul­garia, but he set the wheels in motion for lib­er­a­tion in 1878. 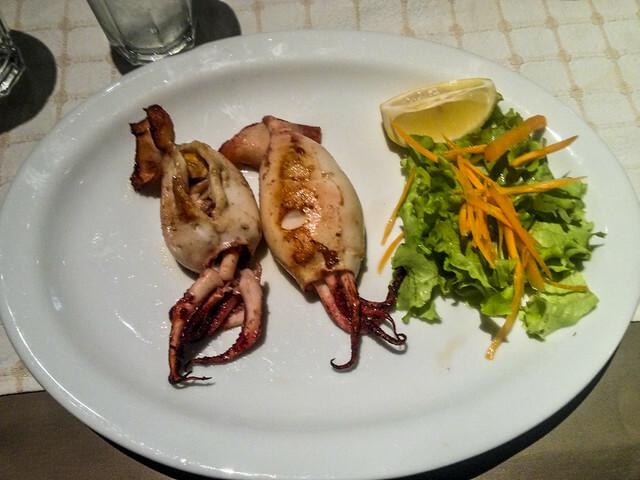 After spend­ing an after­noon walk­ing in the sun learn­ing about Veliko Tarnovo, we joined a Mal­tese cou­ple for lunch. Lunch turned into the whole after­noon vis­it­ing the cas­tle. At night, there was a Soviet era light show pro­duc­tion sup­pos­edly happening. Inter­est­ingly, the show only hap­pens if they can sell enough 30 Euro tick­ets to pack­age tourists and then it is free for every­one else. It is a bit of a gam­ble as nobody in town actu­ally knows whether the show will go on until about half an hour before it begins. Oddly, nobody seems to know exactly what time it begins at either! Lucky for us they sold enough seats. It was, indeed, a cool show. The show remains true to its 1980s tech­nol­ogy bring­ing to life the cas­tle and fort walls. But, I think it wouldn’t have been worth pay­ing 30 Euros for. I cov­ered this adven­ture in another post because it deserved atten­tion in its own right. 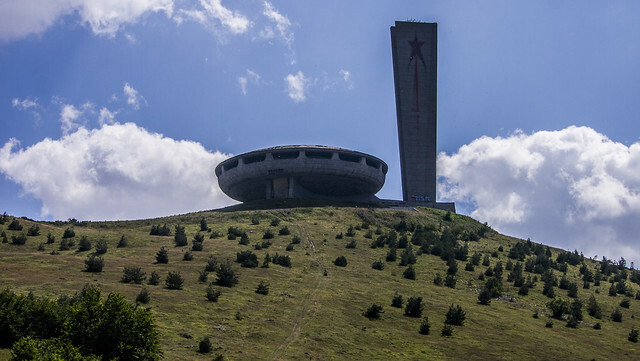 Through the Hos­tel Mos­tel, we were able to go on an unof­fi­cial tour to visit an old Soviet era aban­doned build­ing that looked like a UFO. Eerily, the place looked a lot like Montreal’s Olympic Sta­dium. We explored the inside and out of a build­ing con­structed to be a con­fer­ence cen­ter and rep­re­sent all the glory of com­mu­nism, but today it stands looted and rot­ted. 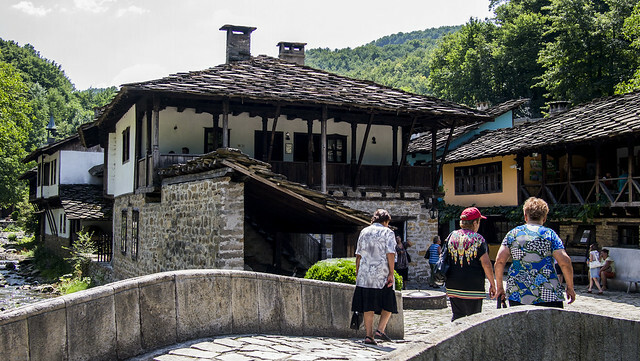 It’s con­sid­ered an embar­rass­ment among Bulgarians. We also vis­ited a Baltic water museum, which shows how the Baltic peo­ple used water-generated power to oper­ate every­thing from wash­ing machines to saws. Our guide told me his cus­tomers either love or hate this sort of thing. I think it takes a spe­cial kind of geek to appre­ci­ate a snap­shot of tech­no­log­i­cal inno­va­tion. It was truly impres­sive to see build­ings engi­neered to be machines that are pow­ered by water. That brings us to the end of Veliko Tarnovo. It was a pleasent sur­prise, but the beaches of Varna were await­ing us. This entry was posted in Articles, Bulgaria, Tim Fisher on 3 October, 2013 by Tim Fisher.